My match with Donny Ariel has, at last, begun! It was conceived of 7 or 8 years ago, when several people were betting a total of $10,000 on whether I would manage to score 0.5/10 (a draw) or 1/10 (when "my backers" would win). Donny reconsidered at the last minute back then, but then nostalgically called me last week, and we played a g/90 9 second delay game yesterday. I was about to make the excuse to you that I had only 20 seconds left here, but then I realized this happens to me in every endgame-- I don't know what to do; I spend a lot of time thinking about it, then I'm low on time and play badly and say "well, but what could I do; I had no time." The real problem is that I usually don't care anymore by move 35; I just want it to be over. 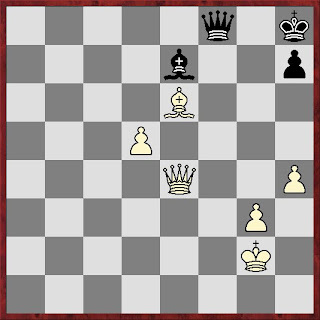 I traded queens stupidly, (Qf5) but white has a great move here. 43. d6 seems to be winning. After 43...Bxd6 44. Qd4+ wins the bishop after Black interposes with the Queen. IS 318 is in clear 1st place. Congratulations on winning the National HS Tournament! I heard a rumor from London that IS 318 won the high school nationals. Congratulations on winning (and on all the national publicity. has anyone noticed they took our rights away?